The MC9190-Z is a high-performance, highly rugged RFID handheld reader targeted for use in very demanding applications and environments. Designed for medium- to long-range RFID read applications, the MC9190-Z delivers best-in-class RFID read range and accuracy in an ergonomic, integrated RFID and bar code device. Its rugged form factor excels in virtually any environment, indoors or outdoors. The MC9190-Z joins Motorola’s broad portfolio of fixed, handheld and hands-free RFID readers, used in more applications, more industries and more countries. Our comprehensive offering of RFID solutions helps our customers simplify deployments, lower costs and maximize return on investment. 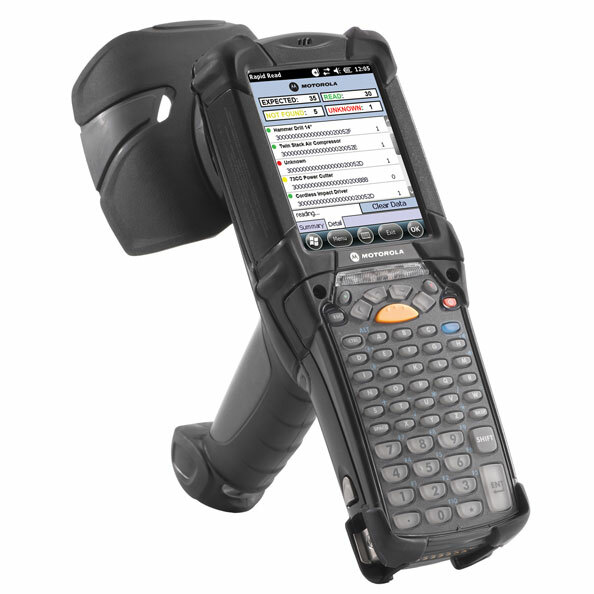 Integrated RFID and bar code data capture in one rugged device gives you lower total cost of ownership. Accurate, long-range RFID performance allows more accurate inventory-count operations to better manage on-the-floor, back-room and distribution inventory. So you can reduce out-of-stock and excess inventory carrying costs. The MC9190-Z can withstand a six-foot (1.8-meter) drop to concrete, 2,000 one-meter tumbles and has an IP64 sealing to help ensure reliable operation in spite of everyday drops, bumps and exposure to dust and liquids. It's built to work hard, even in your toughest environment. The most ergonomic RFID handheld reader in its class, the MC9190-Z is easy to handle, so staff can use the product longer with less fatigue. That means more frequent and more productive cycle-counting and data-capture takes. The MC9190-Z features a large 3.7" VGA colored touch-screen with reduced glare for easier use indoors and outdoors. The MC9190-Z delivers wired-line grade security without impacting wireless performance. It features native FIPS 140-2 Level 1 certification, support for all the latest encryption and authentication protocols, and compatibility with Motorola's Mobile Security Suite for device-level protection and compatibility with Motorola's Mobile Virtual Private Networks (MVPNs). Common access card (CAC) capability lets you use optional accessories to support authentication for government applications.